& NEW ZEALAND THIS SUMMER! The Frontier Touring Company is delighted to confirm the return of critically acclaimed music legend Leonard Cohen to Australia and New Zealand for a series of enigmatic performances throughout November and December. Cohen - along with his incredible nine piece band featuring the likes of Sharon Robinson, the infamous Webb Sisters and musical director Roscoe Beck - will be performing to audiences across Australia's major cities as well as performances in regional towns Cairns, Townsville and Wollongong. Australians will also be treated to two very special a day on the green performances at Hunter Valley's Bimbadgen Winery (NSW) and Geelong's The Hill Winery (VIC). New Zealanders will have the opportunity to see the immeasurable performer in December as he plays to audiences in Christchurch, Wellington and Auckland. These are Cohen's first performances in our countries since his 2010 fourteen-date tour which included Frontier Touring's very first performance at the iconic and beautiful Hanging Rock. Cohen's soulful voice and the stunning ambience of Hanging Rock were clearly a winning combination as the performance earned Cohen the Helpmann Award for Best International Contemporary Concert and overwhelming acclaim. Uniquely for such an iconic musician, Cohen’s literary praise rivals that received for his music. In 2011, he was awarded the prestigious Prince of Asturias Award for Literature, which sits alongside his inductions into both America and Canada's Music Hall Of Fame and the Canadian Songwriters Hall of Fame. At his induction into the American Rock And Roll Hall Of Fame, he was recognised by Lou Reed as "without question one of the most important and influential songwriters of our time, a figure whose body of work achieves greater mystery and depth as time goes on". 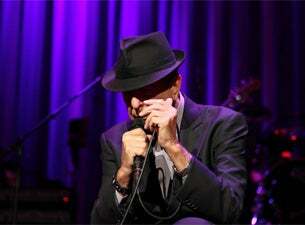 Casting an eye across Cohen's musical offerings across his decades as a performer, there is no doubt of Reed's claim. Albums like Songs Of Leonard Cohen (1967), Songs Of Love And Hate (1970) and I'm Your Man (1990), right up to 1992's The Future, 2001's Ten New Songs, 2004's Dear Heather and last years Old Ideas are rightly considered classics. Revered not only by critics and audiences but also by fellow musicians, Cohen's songs have been famously covered by a variety of artists, each version a fascinating insight on Cohen's impact and lasting influence on the music industry. From Judy Collins' 'Suzanne' to Jeff Buckley's seminal rendition of 'Hallelujah', Cohen's songs have travelled as far and wide as their author. U2, REM, Sting, Nick Cave, Rufus Wainwright and the late Johnny Cash are among the other famous devotees. It is estimated that his songbook has been covered over 1,330 times by other recording artists.